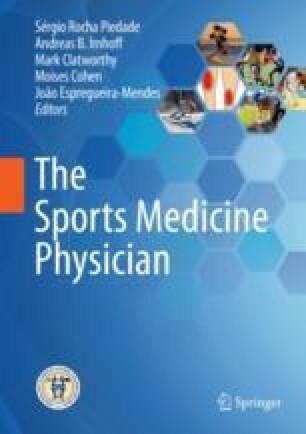 In sports trauma scenario, the sports medicine physician must proceed to a primary systematic evaluation in a timely fashion (primary survey) and early identify and treat if possible in the sideline the life-threatening injuries. Although rare, unrecognized abdominal and pelvic injuries in sports setting continue to be a cause of preventable death. Abdominal trauma evaluation can be challenging and is extremely important, especially when significant kinetic energy is transferred to the torso from a direct blow, deceleration, or penetration injury. The correlation between trauma mechanism, the abdominal area involved, and the hemodynamic status is mandatory, as it has practical implications in diagnostic and treatment strategies. Patients with abdominal trauma and unstable hemodynamic status non-responsive to fluid resuscitation may be (with high probability) candidates for a resuscitative laparotomy. In this case, identifying life-threatening injuries enables priority-oriented management, and therefore point-of-care imaging (like FAST—focused assessment with sonography for trauma), or other procedures (like diagnostic peritoneal lavage) directed for the detection of free fluid in the abdominal cavity (blood) is mandatory. Patients with abdominal trauma and are hemodynamically unstable can be submitted to more accurate diagnostic procedures (like computed tomography) to define the best definitive treatment. Management of blunt abdominal injuries has evolved during the past decade to more non-operative management due to the evolution of the critical care units, to the implementation of damage-control hemostatic resuscitation protocols as well as to transvascular procedures to stop the parenchymal bleeding. Return-to-play decisions after blunt abdominal trauma should be individualized. There is a lack of consensus on recommendations for resuming full activity after blunt abdominal trauma injuries. ATLS Subcommittee, American College of Surgeons’ Committee on Trauma, International ATLS Working Group. Advanced trauma and life support—ATLS 9th ed. J Trauma Acute Care Surg. 2013;74(5):1363–6. https://doi.org/10.1097/TA.0b013e31828b82f5. Cirocchi R, Montedori A, Farinella E, Bonacini I, Tagliabue L, Abraha I. Damage control surgery for abdominal trauma. Cochrane Database Syst Rev. 2013;(3):CD007438. https://doi.org/10.1002/14651858.CD007438.pub3. Alonso M, Brathwaite C, Garcia V, et al. Practice Management Guidelines Work Group. Blunt liver and spleen injuries: non-operative management. http://www.east.org/tpg/livspleen.